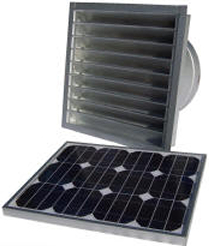 Features 20 watt remote mounted solar panel with 15 feet of shielded wiring and low profile mounting brackets. 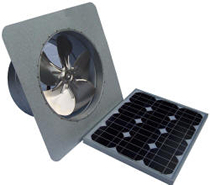 Unit comes standard with corrosion resistant zincalume alloy vent housing, ultra-quiet 14 inch fan, and thermal switch. Gable fan is rated for 1350 CFM maximum airflow and can effectively ventilate an attic space of up to 1800 sq ft. Unit is designed to mount behind an existing gable vent.